There are two types of exchanges in crypto industry, that is a centralized and decentralized exchange. 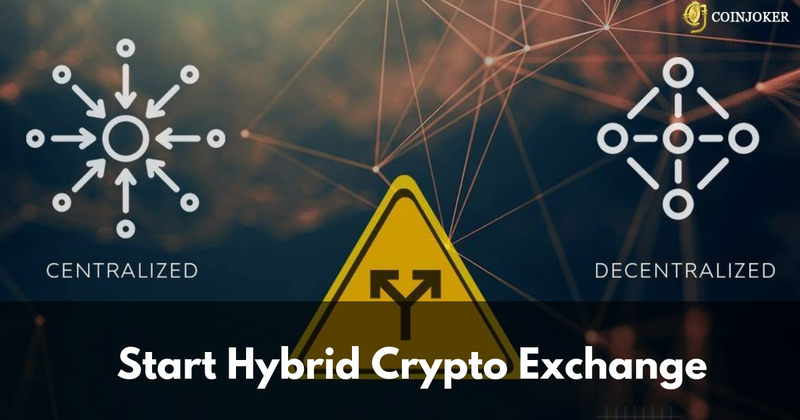 As the word “hybrid” itself defines it is a combination of both centralized and decentralized cryptocurrency exchange(CEX+DEX=HEX). Thus the hybrid cryptocurrency exchange will be based on the liquidity and functionality of a centralized exchange platform as well as the security and confidentiality of decentralized exchange platform. Why hybrid cryptocurrency exchange is important? The hybrid exchanges will unite the advantages of both centralized and decentralized exchanges, which includes the cooperation with large investors as well as the trust of many users. Security token exchange - Offers a secured exchange with the state of art security features, thus creates a complete, reliable and safe exchange for your users. Digital asset exchange - The technically advanced digital asset exchange website will allow exchanging any type of digital assets like bitcoin, ethereum, altcoin etc,. UI design - The cryptocurrency exchange platform with unique UI design will get more customers from all over the world. Trading dashboard - This dashboard will help your customers to know more about what is happening in the global cryptocurrency market, through which your traders can know about the volume and trading details of the actual moving cryptocurrencies. The overview of this dashboard will comprise of, Order book, trade summary, buy/sell section, active orders, recent orders etc. Dynamic CMS - Serves a powerful customer experience for all kinds of devices, which helps in managing the digital information of your business. This CMS includes social links, landing page, policy page, logo, about us etc,. Security - Ensures safety with two-factor authentication for your user account. Currency pair management - This exchange platform will let your customers to manage different currency pairs which they want to trade. Self-managed to host solutions - To avoid procurement costs, the hybrid cryptocurrency exchange software offers self-management and hosted infrastructure. Trading report - The trading report management enables to track and record every single transaction in the trading account. Wallet management - The digital asset wallet development will allow users to secure and manage their cryptocurrencies/digital assets within their crypto wallet. Marketing features - Delivers major marketing features for your cryptocurrency trading platform, thus marketing is essential for any cryptocurrency business as well as other business. Trading market set - The P2P crypto exchange will allow the traders to communicate directly without any middleman. Thus p2p exchange is the best example for decentralization. High-performance computing - the built-in components of the software provides the ability to proceed plenty of orders per second. Banking grade security - The sensitive data and funds can be kept safe with high secured banking grade feature. Enterprise segment - Offers high technologies to carry out multiple assets trading for an enterprise solution. Transcend using A.I - The crypto market can be analyzed to handle risks, with the use of open source, inter-market analysis etc,. API integrations - This feature offers 3rd party API for making your cryptocurrency trading platform to function without any flaws. It also offers many features needed for operating the exchange platform and so eliminates duplication. In these days, the people and exchange owners prefer the decentralized type of exchanges. On the other hand, there are people who need a guarantee for their investments which can be possible through centralized exchanges. If you combine both of this model in one hybrid cryptocurrency exchange, you can welcome every crypto users without any risks. Need help? Contact Us . We are the cryptocurrency exchange development company reaping you the benefits of both centralized and decentralized exchanges in the single compact hybrid exchange platform. Tell us about your requirements now.